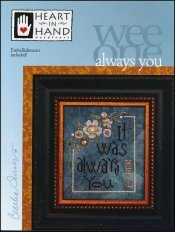 Wee One: Always You [G1387] - $8.50 : Yarn Tree, Your wholesale source for cross stitch supplies. Cross stitch pattern from Heart In Hand. The words "It was always you" accented with flowers. Alphabet provided to personalize the design. Stitch count 52w x 63h. Embellishments included.